It’s always exciting to see African comics evolve away from the superhero genre into a more imaginative and artistically daring terrain. 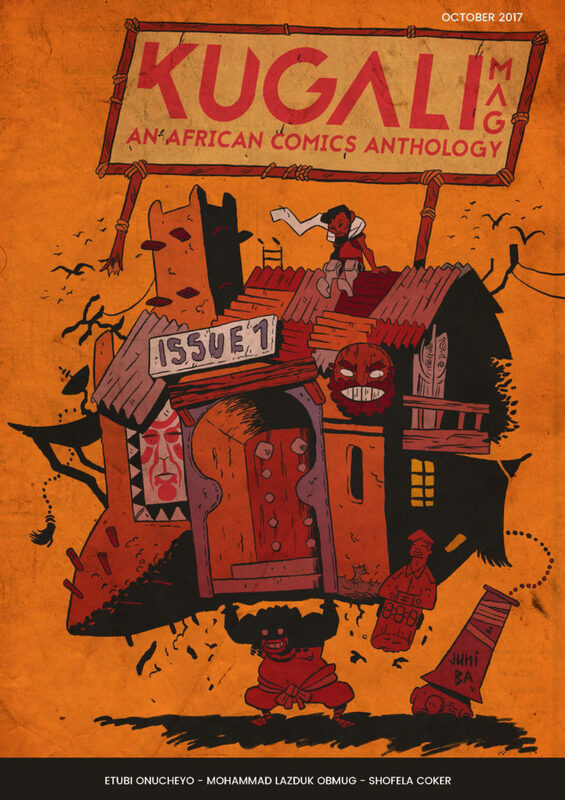 Comics such as Wrath House by the Kalu brothers, Kudzai Gumbo’s Paper Angels, Nkarim Chronicles, Setor Fiadzigbey’s Lake of Tears, Collyde Prime’s Misfits, Fumar Mota’s Disciples and Paul Louise-Julie’s Yohance among others capture this quite beautifully. Self-taught Senegalese artist Juni Ba’s Kayin And Abeni is one of such projects that toes this outlier African comic making line. What stands out most about the comic are psychedelic African aesthetic and the quirky art; boy, is it a beauty to behold! 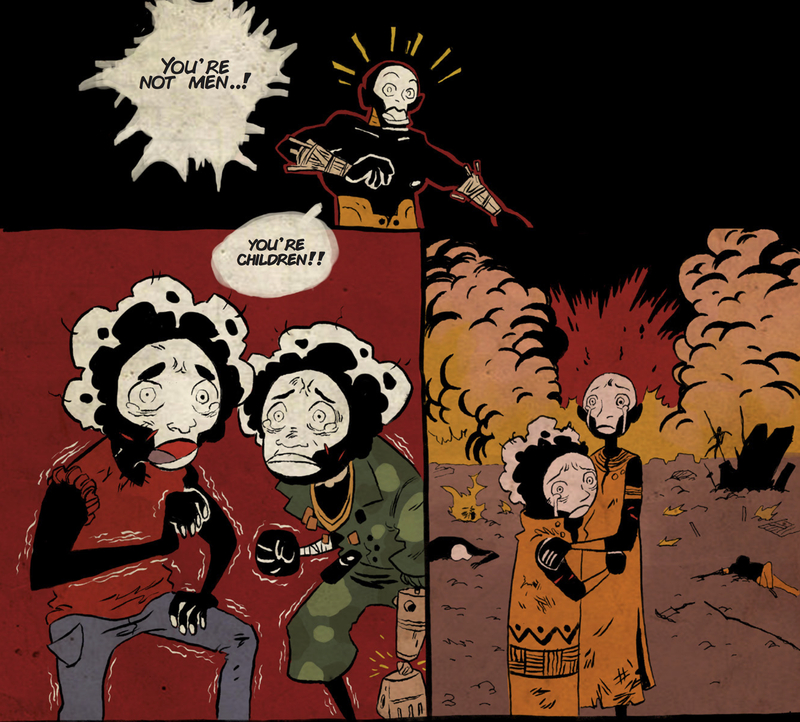 Squid Mag’s Kofi Asare snagged this interview with Juni Ba, exploring his art, his comic, Kayin And Abeni and his take on African comics. How old were you when you first began to draw? With your skills, I can readily tip you off as a self-taught illustrator, most times the self-taught churn out the best? I was eleven! It all started because I had been creating my own stories with my toys, and since I couldn’t buy an action figure of every character I liked, I drew those figures and played with them. The big fire starter was Sonic the Hedgehog. He’s the reason I started doing this. and started drawing Sonic comics. Then I moved on to other subjects. 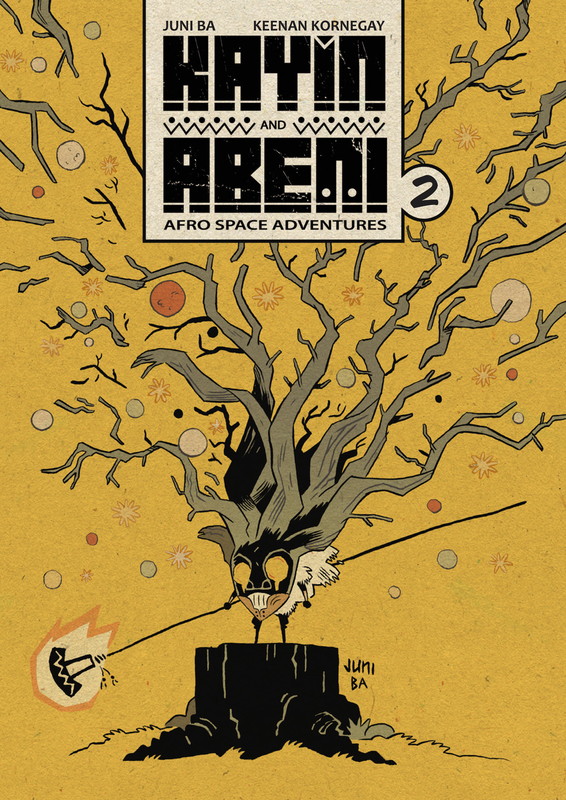 Kayin and Abeni captures Afrofuturism beautifully and I have included it in my collection of afrospace comics along with Yohance and Wrathhouse. Playing around the concept of space’s limitless attributes, would you say you’ve done justice to the sci-fi and urban fantasy genre? I have absolutely no idea. Even calling it a space comic was a way to make it more palpable and understandable for people. The more the ideas come, the more it’s turning into a fantasy world with supernatural elements mixed with sci-fi. We don’t work on this with an idea of it being a specific genre. It’s mostly a platform to try things, experiment etc… We’re (Juni Ba and Keenan Kornegay) 24 and 25 years old, so this is kids playing with toys and learning through them. Don’t you think the tale of Kadogos (child soldiers from the DRC) has been told too many times? It might have established the premise of the first issue but shouldn’t we be moving on to more profound and intricate African stories like what you did with The Three wives of Sartyi? This story was actually influenced by Beasts of No Nation, and the idea came through because of what the main characters had lived. The first issue is very much about presenting the world and characters in a concise way, and show what their mindset is. Using this theme was a way to put the main characters in front of a moral dilemma. The second thing is the stories are trying to pull from African folklore and history, so that felt like a subject we could tackle. This is also why we put extra pages in each issue with sketches, our process and also a presentation of an African piece of lore that inspired the story. It’s important to present the real-life sources that inspired the fantasy. We’re definitely going to start using African folktales as inspiration though. What goes into your design process when creating your characters? Keenan gave me rough descriptions. Personality, age…that sort of thing. Then I tried to create an appearance that conveys what sort of feeling I wish for them. For example, there’s a giant warthog in the first issue; he’s voluntarily very big but is dressed like a monk/priest figure. He was meant to be imposing but calm, so making it a larger than life animal felt appropriate, and giving him a robe made him look like some kind of scholar or philosopher. I see you draw inspirations from things in both worlds. For example, boats (pirogue) as raid spaceships and a wooden statue could easily become an oracle. Those direct nuances seem to be ingrained in you. Your African heritage is very prevalent in most of your work. What is it about being mixed that inspires you? Perspective, mostly. As a kid, I would mix traditional stuff in my house with, say, Action Man and Teen Titans. It meshed well because I just wished it to. As you grow older, people start putting walls around your imagination, saying you can’t use this or that because it’s from this or that culture and they don’t mesh together. I never believed that. I say I’m mixed but the truth is, we all are. We’re all the products of mixes. If not genetic, then cultural. Even a Kenyan guy born of Kenyan parents is sort of mixed the second he gets exposed to non-Kenyan influences. I grew up between France and Senegal and that makes it easier for me to pull from different cultures, but I also take from Japan, America, Belgium, and any other place where I find inspiration. What part of designing is most fun and easy? 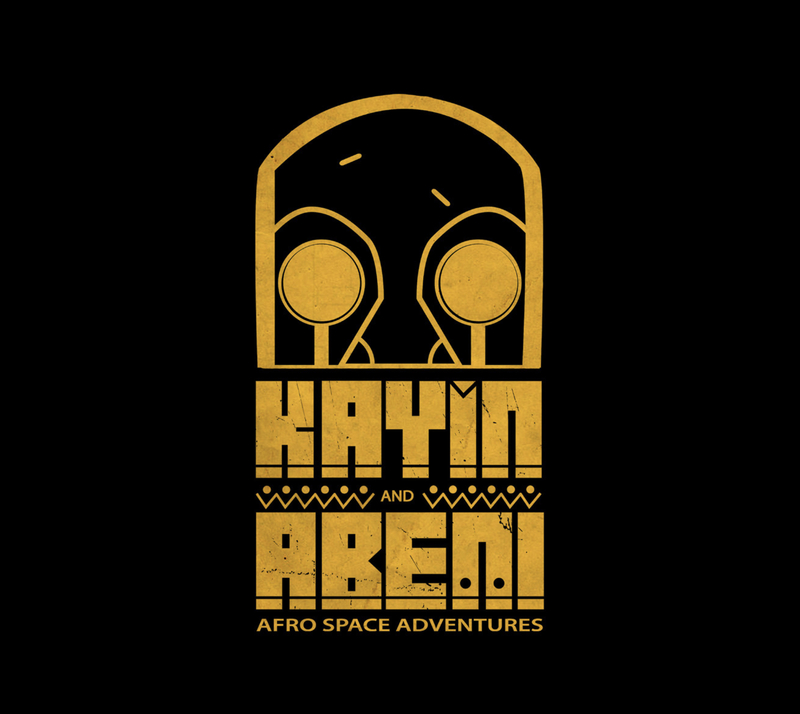 Also, what is most difficult; the immense work that went into Kayin and Abeni must have been one hell of a creative trip? The sketch part is probably the best. It’s a lot of trying things, and going eureka! Most of the world is designed with the following logic: instead of taking a generic sci-fi/fantasy object and adding African things to it, take an African thing and add sci-fi or fantasy things. Like wires or cables for example. From that, the universe came about very fast. Very low-tech, busted and dirty, kinda like some places where I grew up. It reflects the state of mind of the characters and makes it look like a place that’s known better days, and is now struggling to remain. There’s a lot of research, and pulling from personal experience, but it is most akin to something like what Tolkien or Thor comics do when reinventing Norse folklore. This is a fantasy world that happens to pull mostly from Africa as a source of inspiration. What is your most favourite subject to draw, you usually go for the outlandish and surreal compositions? Monkey Meat and The Unlikely Story of Felix and Macabber which needs backing on unbound could be bagged as very eccentric. I don’t necessarily have a favourite subject, but I’m a bit of a fan of using images to represent things in unrealistic ways. Making it an allegory, or exaggerating things helps convey emotion in a larger than life manner. 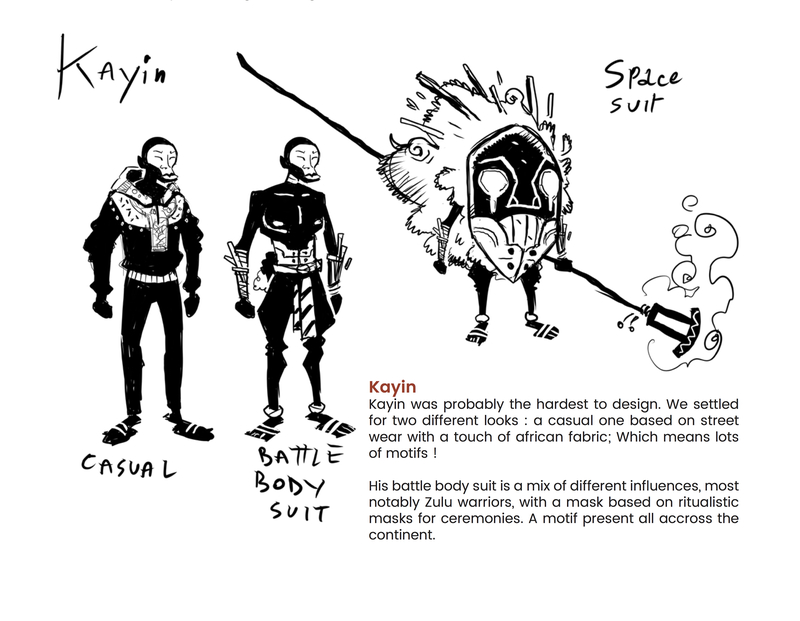 Can we talk about your use of the wide variety of masks, all manner of African art objects and especially Kayin’s weapon of choice, the Imahora Awo and space suit? Keenan found the name. As for the design, I like to pull from different sources – African or not – and mix them all to create something new. Everything is designed with “what does it say visually” as first criteria. But the function of masks in Africa is very often tied to religious events and such, and that’s going to come into play at some point as well. One would have thought this was a solo project. How did Keenan Kornegay’s involvement propel things? Keenan contacted me with a rough idea of it, we worked on the script for the first issue, and have done some back and forth in the design phase with his notes and changes. He’s since decided to move on to other projects and is going to come back from time to time. That means I’m going to be writing as well as starting with Issue 2. It’s evident you created the world in your own image – a peculiar fantasy version of Africa set in space, 2001 a space odyssey inspired, the skull island based on Timbuktu architecture or Larabanga mosque, everything from talking animals to flexible outlooks of your characters. How much weirder do things go? Very weird. This is mostly based on African folk tales. So animals talk, there’s probably gonna be magic, and the world is unravelling as Kayin and Abeni discover it. We’ll get to delve more and more into strange places and peculiar characters to meet. 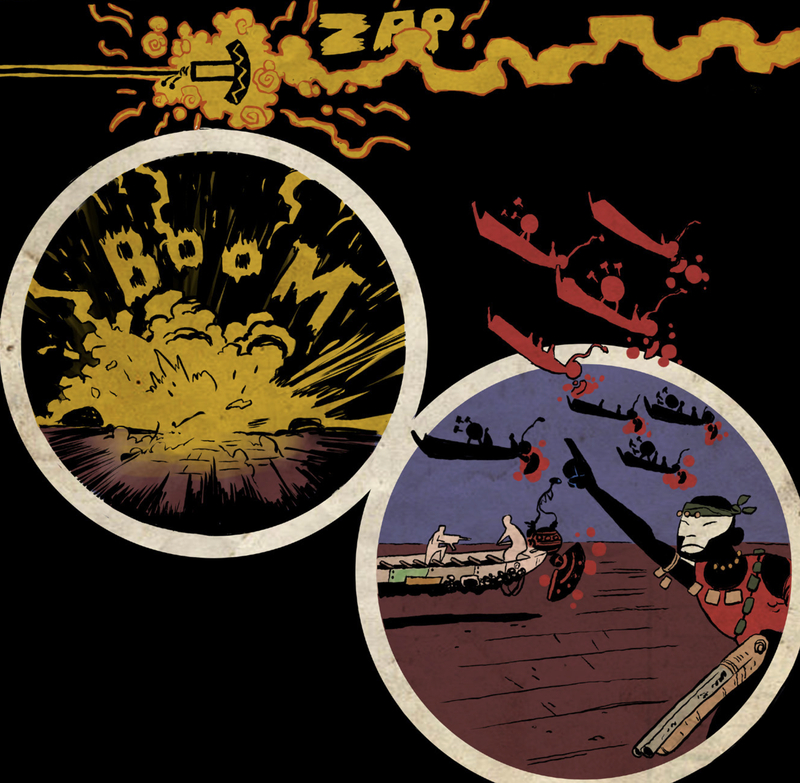 What is in store in issue 2 (Seeds of the Father)? The first was fast-paced, might have given us an impressive welcome but depth is what I yearn for and if it will last the test of time. This one is a very personal story. The format is still the same (16 pages mean a lot of restraint and work to tell the story efficiently. It’s a way to put limits and learn to work with them). The first issue was very packed with a lot of things to present, but issue 2 is much simpler, more focused on Kayin and his inner struggle as he’s fighting a physical opponent, but also the memory of his dead father. people start putting walls around your imagination, saying you can’t use this or that because it’s from this or that culture and they don’t mesh together. I never believed that. Finally, do you have any of your artwork for sale (posters, sketchbook, print etc…) for people who like your work as well as anything that needs backing? The main thing right now is the Unlikely Story of Felix and Macabber. It’s an all-ages book set in a world of monsters. It’s about a little kid who’s bullied at school, yearns for a masculine model, a father figure, and thinks he found one in Macabber, once the greatest wrestler of his time; a model of masculinity. Thing is Mac is now old, alone, grumpy, and the image he projected is perhaps not quite true, and not quite as awesome and enviable as Felix believes. So it’s gonna be monsters wrestling, and a reflection on toxic masculinity. 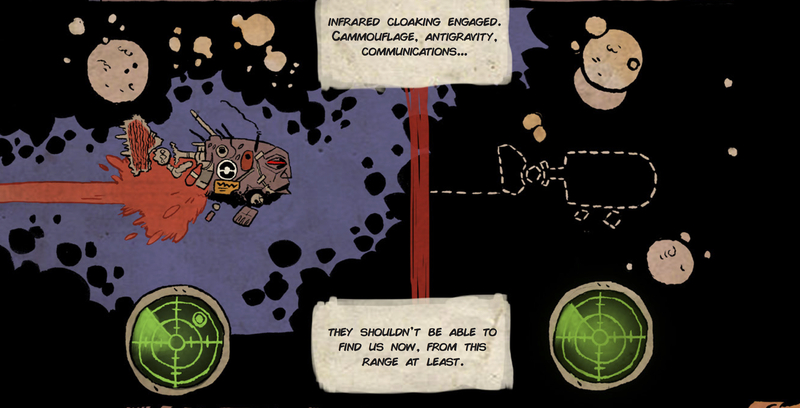 It’s currently crowdfunding at Unbound right here: Felix And Macabber. As for the people interested in getting a paper version of Kayin and Abeni, each story is going to be featured in the Kugali Magazine, so people can grab that and get a copy. Let’s wrap things up. What are your thoughts on the African comic scene and how different (is) your creation (is) from the bunch you have read already? I’m really impressed by the effort made to get content created. 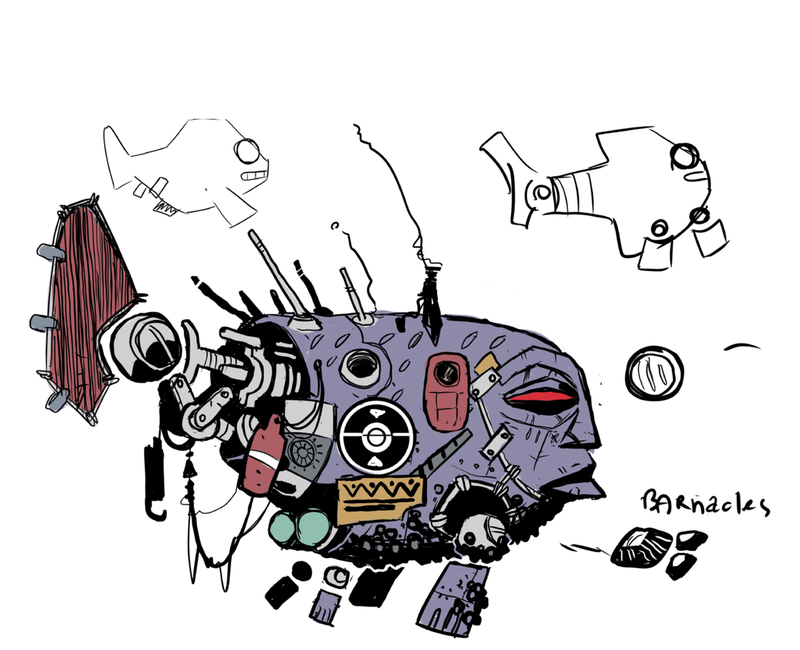 The one comic that has a design that really impresses me is Yohance, and other creations by Paul Louise-Julie. Having talked with the guy, his approach to it is really interesting, and I think a lot of creators could take note from it. 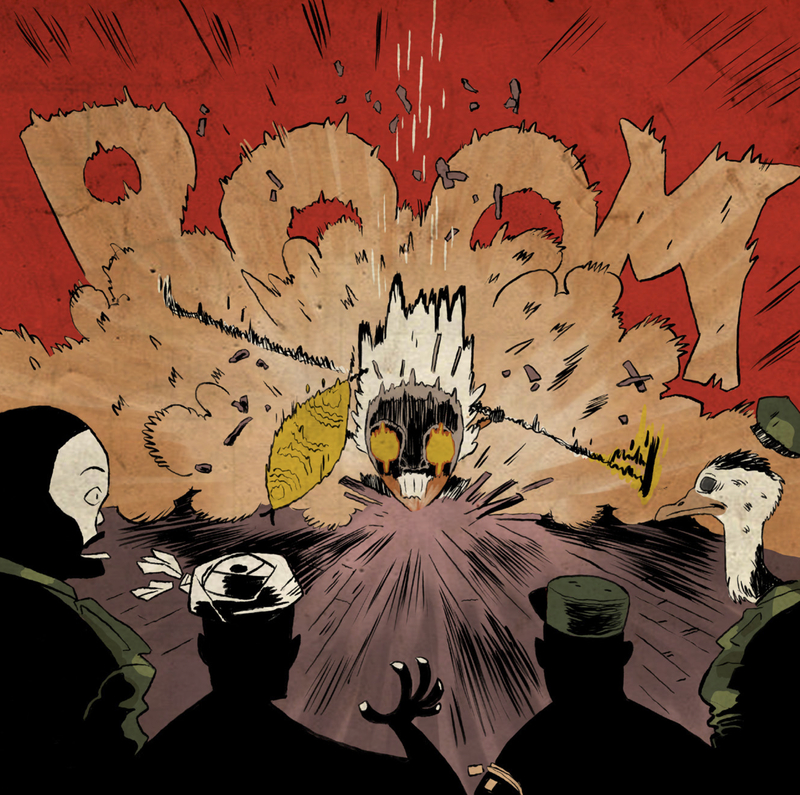 The second impressive thing to me is the creation of Kugali and it’s magazine where African Comics are curated. It’s the kind of platform we need, and which needs support. Read the first and second issue of Kayin and Abeni here. You can also check out more of Juni Ba’s art on his website. Alternatively, follow him on Facebook, Twitter, Instagram or Tumblr.